The 2016 WIDER Annual Lecture by Martin Ravallion is held on Wednesday 23 March 2016 at Stockholm School of Economics. The event is organized in collaboration with the Stockholm Institute of Transition Economics (SITE). Martin Ravallion, a leading economist in the research of poverty and policies for fighting it, is best known for his proposal of the ‘$1 per day’ poverty line, which became very widely accepted a universal measurement for monitoring progress against global poverty. He holds the inaugural Edmond D. Villani Chair of Economics at Georgetown University. Until 2013 he was Director of the World Bank’s research department, the Development Research Group. During the WIDER Annual Lecture he will discuss the economic and political issues of the use of direct interventions, such as cash transfers and in kind contributions, against poverty. There is much hope for these interventions, but also much frustration; their performance in reality has often fallen short of policy makers’ expectations. The lecture will review the evidence on both the successes and failures, based on the many impact evaluations that have been done over the last 15 years. Selection of images from the WIDER Annual Lecture 20. 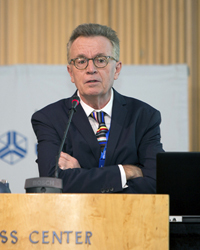 View the WIDER Annual Lecture by Martin Ravallion on Direct interventions against poverty in poor places. Displaying 8 of 8 results.